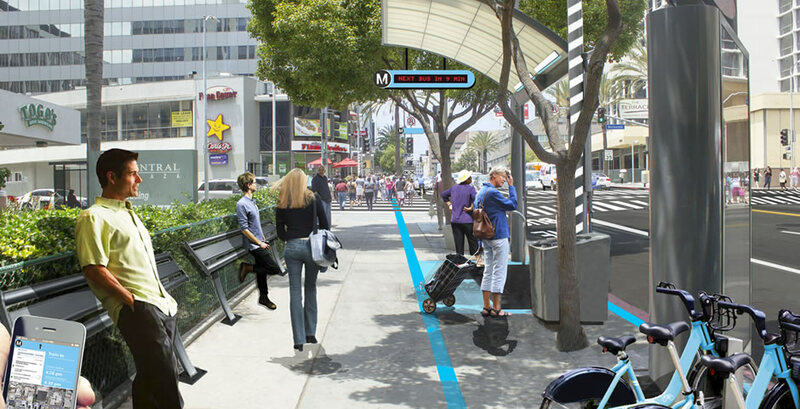 The Metro First/Last Mile Strategic Plan helped catapult LA Metro into a leadership role nationally in terms of going ‘beyond the turnstile’ to suggest enhancements to the streets and pathways people use to access transit. The ultimate goal of the Plan was to outline how community partners and Metro can improve the experience of getting to transit, recognizing the positive link between good urban design and ridership. Our Here LA team members, while at a previous firm, defined a qualitative and quantitative process by which stakeholders can analyze and understand access challenges and identified a set of tools to address these challenges as part of the Strategic Plan. The Plan is now being used in several ongoing efforts throughout the County. Project completed while at previous firm. 2015 National Planning Excellence Award, American Planning Association (APA), the highest honors from the APA. 2014 President’s Award, Southern California Association of Governments (SCAG).